Players on the Winning Poker Network (WPN), the network which encompasses Americas Cardroom (ACR) and Black Chip Poker (BCP) are advised to proceed with caution with regards to making new deposits as complaints over lenghty withdrawal times and bitcoin payment irregularities are starting to surface. While all players need to be cautious when using any unregulated US facing poker site, feedback on various poker forums and from many of our own ACR/BCP players suggest that the once swift withdrawal process offered by sites on WPN has, in many instances, slowed up dramatically - with some players waiting weeks or in some cases months for withdrawals to be made good. There have also been alarming patterns detected in the timing of any bitcoin (BTC) withdrawals. Again, although we would generaly advocate bitcoin as one of the safest ways to deposit funds to poker sites, especially US facing ones, it is worth noting that some players have noticed that BTC withdrawals only seem to be processed when BTC value is at its highest, after which the price drops off - which obviously benefits the site and certainly not the player. There have also been complaints about the excessive cost to play at the site with rake estimated at between 10-15% depending on which deposit method you use. Even more worryingly, rumours are starting to circulate in the industry of embezzlement at ACR specifically relating to BTC payments. It is suspected that certain accounts set up by someone within ACR are being sent very large BTC payments on a monthly basis, with the accounts supposedly belonging to an unknown affiliate. Both the size, frequency, and the expeditious nature of the payments seem very unorthodox, especially when other, known affiliate accounts have reported long delays and even complete non-payments of commissions owed. While we cannot confirm the above rumours as fact, we would certainly advise our players to excerise caution when making deposits to WPN sites until the withdrawals situation improves. If you do deposit, make sure you only put down what you can afford to lose, and be prepared for a potentially agonising wait for any withdrawals. 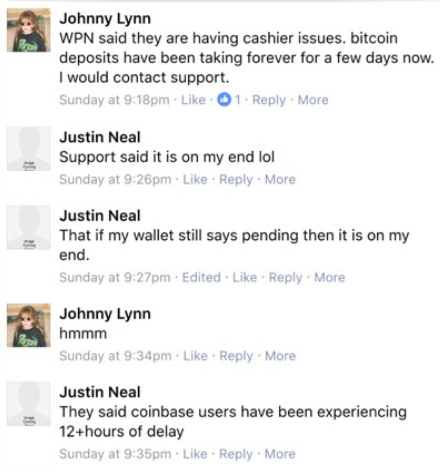 There was further panic among WPN players yesterday when ACR announced that they would be suspending all BTC deposits and withdrawals until further notice. However, it turned out that on this occasion the suspension was due to scheduled changes in the bitcoin software. The site has since reopened the deposit/withdrawal options. HSDB - Remove this bs article pls. I asked support about all this before it happened and they acted like I was an idiot and I had nothing to worry about. Smells like a cover up to me.